Traders need an overview of the combined opinion of all their technical indicators. Once you add several indicators in or below your chart, it is difficult to monitor all indicators and derive a combined opinion. The NanoTrader shows you the combined opinion. It is visualized as a colour in the main chart's background. And ... Tactic Orders can automatically place orders based on the combined opinion of your indicators. As usual in NanoTrader, this requires no programming. You see the combined opinion of your indicators. Your main chart is not cluttered by technical indicators. You can automatically send orders based on the combined opinion of your indicators. NanoTrader offers the trader access to over 200 technical indicators. 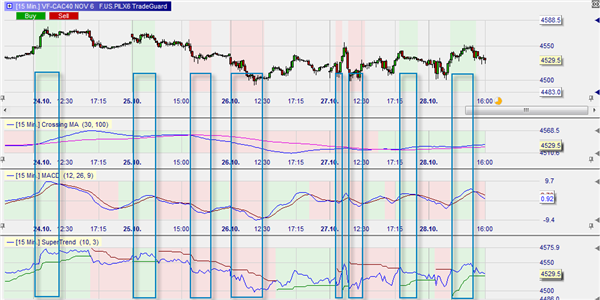 Unique to the NanoTrader is that the trader can combine indicators in different timeframes (aggregated indicators). In this example the trader added three indicators. The bullish (green), bearish (red) or neutral (white) opinion of the indicator is visible in its chart background. The main chart shows the combined opinion: all indicators bullish (green background), all indicators bearish (red) and some are bearish, some are bullish (white). This is the same chart as above. The combined opinion of the three indicators is visible as a colour in the chart background. This chart is very easy to interpret without the clutter of the indicators visible! The Tactic Orders function allows traders to convert the opinion(s) of their technical indicator(s) into orders. This can be done without programming. This example shows a trader using two of his three indicators to generate an order. He as opted for ‘unanimity’ in is indicators’ opinions and asks for a report to confirm a preformatted order. The trader accepts buy and short sell orders. 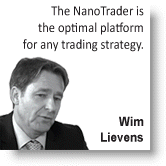 Professional trader Wim Lievens likes the NanoTrader trading platform.